In 2015, the couple went to Modernism Week in Palm Springs hoping to gain inspiration from other outdoor spaces. “We’ve had a few landscape designers create plans; however a, midcentury backyard is typically more minimalistic, and they kept overdesigning and adding in the traditional ‘B’ word (boxwood) into the plans,” she says. Not satisfied with the mismatched designs, Ken and Holly created their own plans. Needing to remove the neglected pool, Ken and Holly decided to redesign the entire space to better capture their mid mod dreams. They reduced the size of the pool, opted for a clean, modern shape and did away with the deep end. Now, they call it the “party pool” because swimmers can walk with a cocktail in their hands from one end to the other, all while staying above water. That wasn’t their only big change. “I love how midcentury [design] seamlessly flows from the inside to the outside,” Holly says. “So in renovating the back, we took the opportunity to raise the ground level so that we when we step out from our sunken living room, [the yard] is at the same level.” With their sliding doors fully open, the matching levels make the back patio feel as much a part of the house as the living room. “We wanted the pool area and porch to have a fun vibe, so I choose a more vibrant palette to help with the playful ambiance. The Sunbrella fabric was the most durable option for outdoor cushions,” Holly says. For the fencing, they turned to block with breezeblock detail—but struggled to find the material in their area. The extra effort was well worth it, as Holly says that people are often surprised to find that the walls are not original. “That makes us happy as we feel we staying true to the integrity of the home and it’s midcentury roots,” she says. the long expanse of block as well as to raise the landscaping so the back hedge will feel more established sooner. “We estimate that in two to three years we’ll have a complete, dense hedge that will be about 9’ tall and block the neighboring house,” Holly says. A midcentury backyard isn’t complete without the proper outdoor furniture, and the Schoolmeester yard is no exception. 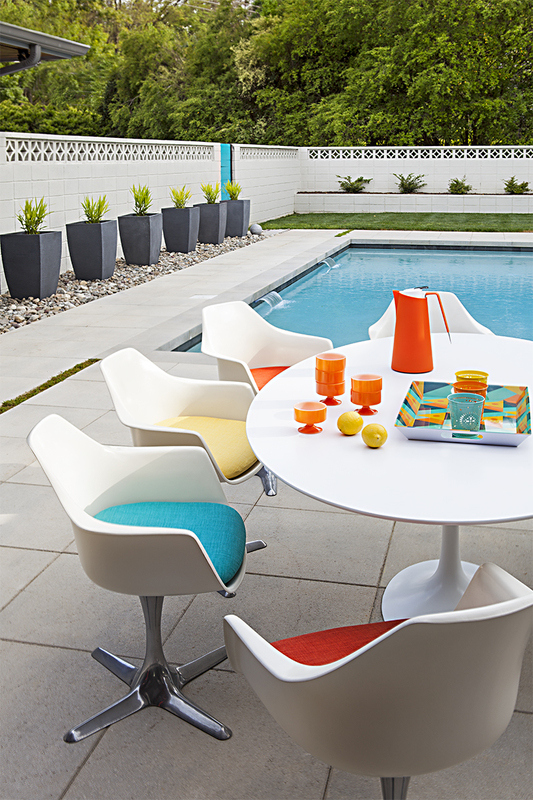 An original Knoll table with Tulip Chairs hosts summer soirees, while vintage Bertoia Lounge Chairs take their rightful place poolside. “Luckily the back porch is very big and thus the table and chairs are completely protected from the elements. It’s literally like an extra room nine months out of the year,” Holly says. 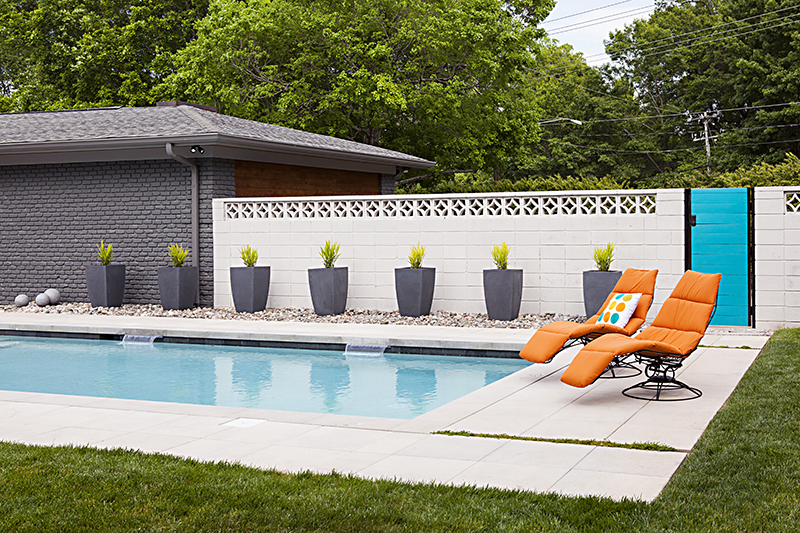 “However, like any good piece of furniture, we clean and protect them frequently.” Ken and Holly now have a midcentury backyard where modern meets playful and functional meets fun—which is exactly what they wanted.